The Pentagon confirmed that US President Donald Trump had signed a decree on the withdrawal of troops from Syria. All parties to the Syrian conflict will try to derive benefits from the current power vacuum and the Syrian Kurds will be the ones most affected by Trump’s decision, US experts say, according to Vedomosti. It is evident that all forces in Syria will respond to the US pullout, the Arsenal Otechestva (Arsenal of the Fatherland) magazine’s Chief Editor Viktor Murakhovsky told the paper. The Al-Tanf enclave on the border with Jordan is likely to come under the Syrian government’s control, and fearing Erdogan’s imminent offensive, the Kurds may redeploy their forces to the north, and in this climate, attempts by the Islamic State (terror group, outlawed in Russia) to resurface are highly likely, the expert notes. Therefore, the troops of the fifth assault corps of the Syrian army are preparing to counter the Islamic State and also take care of the issue with oil and gas fields in Deir ez-Zor, he said. Trump’s decision to leave Syria and the subsequent resignation of US Defense Secretary Jim Mattis are goading the Turkish leadership towards carrying out a new operation against Kurdish units, Nezavisimaya Gazeta writes. This is confirmed both by the statements of Turkish President Recep Tayyip Erdogan and reports about the concentration of pro-Turkish forces near Manbij, controlled by the Kurds. “Turkey is planning to gain control over two sides of the Syrian-Turkish border,” expert of the Russian International Affairs Council Timur Akhmetov told the paper. Meanwhile, Turkey is unlikely to get control of Syria’s entire northeast with all its problems, but will try to create a buffer zone along the border, he noted. If the US departure does take place, the Syrian military may occupy the rest of the territory. However, Russia won’t seek to become a party in solving the conflict between Turkey and the Kurdish units. “Russia will most likely monitor the situation without any evident interference, explaining its priorities and position to all parties. 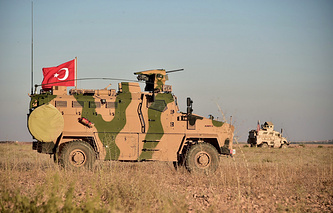 In any case, the Kurds’ initiative on withdrawing government troops should come from the Kurds themselves, and Turkey’s fears should be taken into account,” the analyst said. “The tone of Trump’s statement shows that the Americans will be gradually leaving while coordinating their steps with Turkey,” Head of the Islamic Studies Center at the Institute of Innovation Development and Russian International Affairs Council expert Kirill Semenov told the newspaper.